My name is Amie and I’ve been mountain biking for about 15 years now, but the first 5 years I don’t consider mountain biking. My boyfriend at the time told me, “Just sit on your seat and let the suspension do all the work.” I was falling over constantly, ramming into logs, and walking over even small obstacles. Eventually, I took a mountain bike clinic and it changed everything. I learned how to ride properly and even went to a downhill park in Colorado a few weeks later and road things I wouldn’t have touched before the clinic. Lately, I’ve been doing a lot of coaching. I’m ICP level 2, and PMBIA level 1 certified and have been coaching for 4 years now. 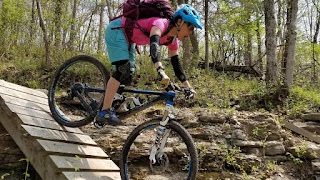 I coach for REI a few times a month and also coach at Sundance Mountain Bike Clinics and my husband and I have our own coaching company, Let it Roll Mountain Bike Clinics. Tell us about the introduction to your #bikelife and why has it been beneficial for you? I was introduced to cycling through my aunts and uncles who used to do road racing in the 90’s. I rode with them on a few group rides during a summer, then joined the swim team and did that instead. In my early 20’s I started running and decided I wanted to do triathlons, so I bought a road bike. I thought mountain biking looked like it would be fun, so a week later I bought a mountain bike and started riding trails. Cycling has been beneficial to me in so many ways. The social aspect and camaraderie are the best parts for me. I believe having close friends and a good social life is key to a person’s happiness, and I certainly get that from my cycling friends. Secondly, I love road cycling and mountain biking equally but for opposite reasons. My mind wanders during a road ride so some of my best thinking and ideas are generated on my road bike. During a mountain bike ride, however, I can’t focus on anything but the trail in front of me, so it gives me a mental break from everything. Lastly, there are the obvious physical and health benefits. The first few years of mountain biking for you were less than ideal, what kept you inspired to keep at it under the circumstance? My first few years of mountain biking were less than ideal – compared to now. I was blissfully ignorant at the time and still enjoyed riding even though I had to get off my bike and walk over log piles. I didn’t know any different so, I just kept riding. What pushed you to go to a mountain bike clinic? Do you remember what your most eye-opening lesson was? My husband noticed on facebook that there was a women’s clinic and asked if I wanted to go. I happened to have the weekend off so I said, “Sure.” I remember being scared to death. I thought I would be the worst person there and that I wouldn’t be able to figure anything out. Even though it was a two-hour drive there, I wanted to turn around and go home. I didn’t think my husband would go for it so I didn’t say anything, I just swallowed my pride and went in. My most eye-opening lesson at the clinic was being told to stand up on my pedals and stay balanced over my bike. That simple advice enabled me to be able to roll over obstacles and descend steep hills. For folks looking to attend their first skills clinic, do you have suggestions that may help them make the best choice for themselves? I suggest that before people take their first clinic they should be able to stand up on their pedals when coasting and pedaling. Also, it is totally normal to be nervous at your first clinic! What do you love most about mountain biking? What I love most about MTB is the challenge. It’s an amazing feeling when I can say I successfully rode a difficult trail or feature, especially when it’s something I’ve had to work a while to get the hang of. Clips or flats? What do you like best and why? I ride both clips and flats and think they both have pros and cons. I clip in if I’m racing, the trail is not too technical, or if there is a lot of climbing. However, if the trail is technical, I’m absolutely in flats. Have you had any biffs (crashes) that were challenging for you on a physical/mental/emotional level? What did you do to heal and overcome? Before I knew how to ride correctly, I had one really bad crash. I had a concussion, was knocked unconscious, and was pretty scraped up. It wasn’t hard for me to get back on my bike, perhaps because I don’t remember the crash at all, I’m guessing from the concussion. When I started riding my handling skills were absolutely horrible. I had to walk over practically everything, or just ram into it and hope I made it over. Taking my first clinic helped with that. I learned to stand up on my pedals and learned wheel lifts there also. My current challenges are mental blocks. I can do a lot of skills in the grass, but when I add speed and try to apply it to the trails I get nervous and end up going way slower than I need to. I can’t lie, sometimes it does drag me down and it does get frustrating, especially when I’m in a group and get dropped. It’s best when I ride with people that aren’t incredibly faster than me, that way I’m not comparing myself to others. What do you love about riding your bike (in general)? I love so many things about riding. It’s a great social sport. Sometimes road cycling I talk to my riding partner the whole time. That’s not as easy mountain biking, so we just talk on breaks. The mountain bike community seems to be more social than the road cycling community, so I enjoy hanging out after rides with people. If I’m road riding alone I get some of my best thinking done, mountain biking I only think about riding, so it tends to clear my mind. It’s a great way to workout, stay in shape, and socialize. I currently have a Trek Fuel for my Mtb. I’m not a diehard fan of any one brand, but things I couldn’t live without are my dual suspension and my dropper post. The rear suspension is so comfortable, I can’t stand riding hardtails. My dropper post has become essential. It’s so nice to be able to get my seat out of the way when doing anything technical. It’s to the point that if I want to fly somewhere to ride, and the bike shops don’t rent bikes with dropper posts, I’ll drive there instead so I can take my own bike. What inspired you to become a certified mountain bike coach? Initially, I wanted to become a coach because I knew people would love mountain biking more if they knew how to ride correctly. It made such a huge difference for me to just learn the basics. Then I realized I could teach much more than just the basics. I really enjoy teaching people intermediate skills: wheel lifts, pump tracks, cornering, etc. For individuals interested in certification, can you explain the difference between IMBA and PMBIA and why one may prefer one over the other? There are a few key differences between the ICP certification and the PMBIA. ICP teaches their instructors to teach in a controlled environment, like a grass field. PMBIA prefers to do all/most of their teaching on trails. ICP requires their instructors to use their specific language. They also emphasize keeping the amount of talking to a minimum. PMBIA is much more lax on the language that their instructors use, and don’t emphasize talking too much. I’m not saying that PMBIA lets their instructors ramble on, they just don’t focus on it as much. The ICP course requires the instructors to be able to detect errors in the participant’s skills. ICP will have fellow classmates go through and purposely make mistakes, and in order to pass, you have to recognize them; PMBI does not do this. I think the courses are both equal and I’m glad that I have taken them both. Taking both of them has made me a more well-rounded instructor, and I encourage anyone getting into instructing to take both courses. What has been your most enjoyable moment as a mountain bike instructor? My most enjoyable moment as a mountain bike instructor is actually several moments. People of both genders take my level one class and don’t even dream of getting their wheels off the ground. 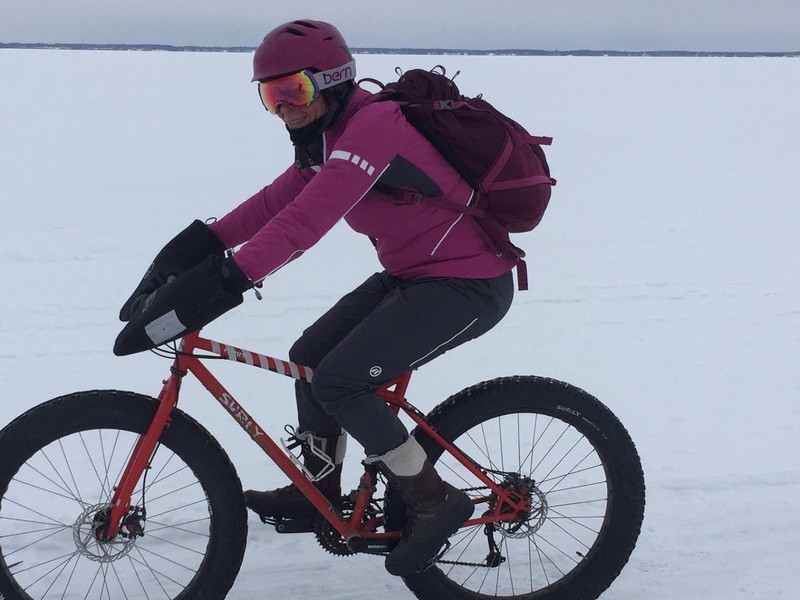 However, I like to add the “wow” factor to my level one classes and give them a teaser to level two classes, so I teach a basic front wheel lifts in my level one classes. I love dispelling the myth that to do wheel lifts you have to “just pull up.” That makes it practically impossible for many people to get their wheels off the ground. Most people can get their front wheel off the ground by the end of class, and are ecstatic. Seeing how proud and amazed the students are at their new talent makes wheel lifts my most enjoyable moment. I feel that the biggest hindrance to females starting mountain biking is their fear of the trail. A lot of times my husband and I talk about our mountain biking classes when we are leading hikes or other activities for REI. The females usually respond that mountain biking is too dangerous, or they will not be able to control the bike. I try to convince them that taking a clinic will help with their balance skills, learn how to control their bike, and boost their overall confidence. 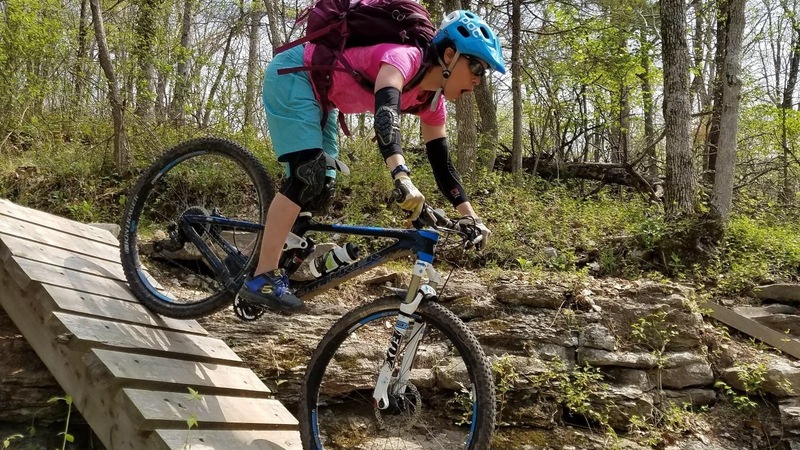 I think that seeing other women riding mountain bikes could encourage more women to be involved. I believe that so many times women have the thought that only men can do certain maneuvers, like bunny hops or clearing table tops. When they see another woman do it they think, “Ok, if she can do it so can I.” Marketing to women seems to be helping as well since the biggest growth in the sport is females. and that you don’t have to go super-fast to have fun. Random fact – My second favorite sport is kayaking!